Archbishop John Clayton Nienstedt was born March 18, 1947, in Detroit, Michigan. He is the son of the late John and Elizabeth Nienstedt of Harrison Township and the second oldest in a family of six children. He has two brothers and three sisters. Archbishop Nienstedt was ordained to the priesthood on July 27, 1974, at Sacred Heart Church, Dearborn, Michigan, following studies at Sacred Heart Major Seminary, Detroit, and the Pontifical Gregorian University, Rome. In 1994, Archbishop Nienstedt was appointed Pastor of the Shrine of the Little Flower Parish, Royal Oak, Michigan. Prior to that, he served for six years as Rector and President of Sacred Heart Major Seminary in Detroit, Michigan. 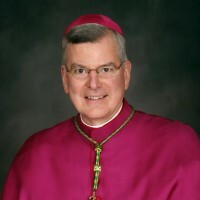 Archbishop Nienstedt’s previous assignments include: Associate Pastor, Guardian Angels Parish, Clawson, Michigan; Priest-Secretary to Cardinal John Dearden; Weekend Associate Pastor, St. Fabian Parish, Farmington Hills, Michigan, and Our Lady of Sorrows Parish, Farmington, Michigan; Vicar General of the Archdiocese of Detroit; Service in the Vatican Secretariat of State; and Pastor, St. Patrick Parish, Union Lake, Michigan. On June 12, 1996, Pope John Paul II named Archbishop Nienstedt an Auxiliary Bishop of the Archdiocese of Detroit. Cardinal Adam Maida, Archbishop of Detroit, ordained him a Bishop on July 9, 1996. Archbishop Nienstedt served as Bishop for the Dearborn, Downriver, Monroe, Northwest Wayne, Southland, and Western Wayne Vicariates from 1996-2001. On June 12, 2001, Pope John Paul II named Archbishop Nienstedt the Third Bishop of the Diocese of New Ulm. He was installed on August 6, 2001. On April 24, 2007, Pope Benedict XVI named Archbishop Nienstedt the Coadjutor Archbishop of the Archdiocese of Saint Paul and Minneapolis and Apostolic Administrator of the Diocese of New Ulm. He served in this latter position until December 13, 2007. On May 2, 2008, Pope Benedict XVI appointed him Archbishop of the Archdiocese of Saint Paul and Minneapolis. He served as archbishop until June 15, 2015.